I have appreciated lobster from an early age. 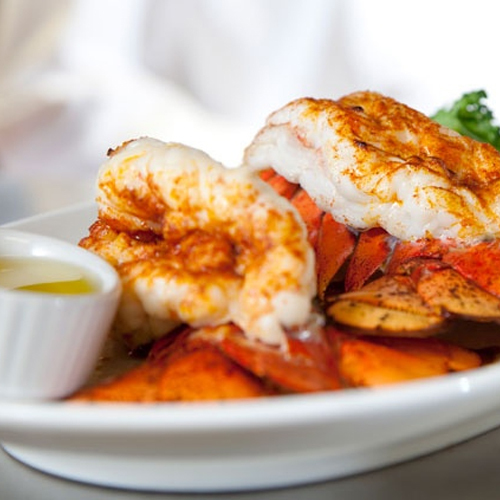 As special occasions rolled around, my mom would present us with broiled lobster tails and drawn butter, which is just about the simplest yet most pristine preparation for this ultimate luxury food. By the time my sister and I reached middle school, we were completely hooked. But of course, lobster isn’t cheap, so it was reserved for special occasions. Back then, some friends of my parents owned a nice restaurant called the Stadium Steakhouse. As you can imagine, they made steaks, but they also had an entrée on their menu that to this day, I’ve never seen in any other restaurant: Danish lobster tails. So, when we celebrated our 11th, 12th, etc. birthdays or were celebrating a ballet recital or softball win, we always asked to go to Stadium Steakhouse, where we always ordered Danish lobster tails. Sadly, these little delicacies were the victims of over-fishing and I’m really not even sure if anyone in the world serves them at this point. As I became an adult, lobster remained one of my ultimate special treats. One time, Food & Wine magazine published a “lobster primer” to teach those of us who are not Down Easterners how to properly cook, dismantle and enjoy a live lobster. We all gathered at mom and dad’s and indulged together. Later, when my cookbook addiction really got rolling, I couldn’t resist Jasper White’s Lobster at Home. I have read that book cover to cover and have stared at the photos forever. Before I got married, my mom, sister, my aunt and I started taking Mother’s Day trips together. We went to Chicago, where we shopped at Michigan Avenue, ate pizza, and saw Fiddler on the Roof at the Chinese Theatre. We went to Amelia Island and stayed in the coolest B&B, took a boat out to see the wild horses at Cumberland Island, and found a shrimp shack right on the dock. So, when my turn to plan the trip rolled around, I knew exactly what we were going to do. We were going to go to Maine and eat lobster like there was no tomorrow. Long story short, we stayed in Boothbay Harbor and my mom and I managed to have lobster in some form for every meal except two. Now, I’m married and have a delightful 6 year old. She’s always been a good little eater with an adventurous spirit. She’s a shrimp fan, loves steak, thinks green beans are for everyday use, while she hates chicken nuggets and won’t even think about eating cereal in the morning ☺. I don’t know if you’ve noticed, but lately, wild-caught Canadian lobster tails have been on sale at almost all of our grocery stores. When Publix advertised lobster tails B1G1, I almost fell out of my chair. Once I regained my composure, I headed to Publix and swooped in. My head was spinning with ideas but I realized that there was one recipe and its picture that I’ve turned to over and over again in that cookbook. That was the one; it was the obvious choice. I knew I had to make Jasper White’s “Pan-Roasted Lobster with Chervil and Chives.” As you can probably imagine, I had no luck finding chervil around here…not even Whole Foods carries it. Luckily, Jasper clued me in that I could mix fresh parsley & fresh tarragon and get pretty close. It’s a fast paced recipe and timing is everything, but oh man!, it is worth it. My husband and I were in heaven with the lingering aroma of flambéed cognac in the air, while my daughter just dug in and discovered at this young age, like myself, that lobster is indeed nectar from the gods. She loved this dish so much that the next day when I asked her opinion about dinner, she said “I’d like lobster.” Yeah, me too. Since then, we’ve taken advantage of these awesome sale prices a couple more times. For Christmas Eve supper at my parents’ house, we had corn chowder with shrimp, crab casserole and pan-roasted lobster. It was heavenly and a perfect meal for one of the most festive nights of the year. And, I realized something. If you keep your eyes open and watch the prices you can serve lobster for as little as $5.00 a person. 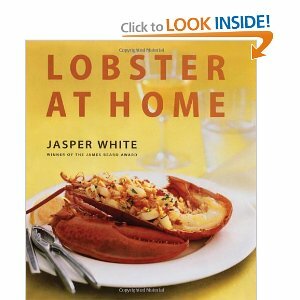 Jasper White’s title Lobster at Home is perfect. You can have it at home and it can be just as special and marvelous as a restaurant on fancy date-night! If you like this, you can subscribe to Elizabeth’s blog Gastronomy (by a Wanna-be Chef) or simply like it on Facebook. This entry was posted in Elizabeth Webber Akre, Food and tagged Columbia, columbia sc, cooking, elizabeth akre, Elizabeth Webber Akre, every woman blog, Famously Hot, food, hospital blog, Lexington, lexington medical center., lexington sc, Lexington Women, lmc, LMC every woman blogger, lobster, Lobster at Home, Midlands, Midlands Women, South Carolina, South Carolina Women, Women, women's blog, women's hospital blog by Kate Gillmer. Bookmark the permalink.